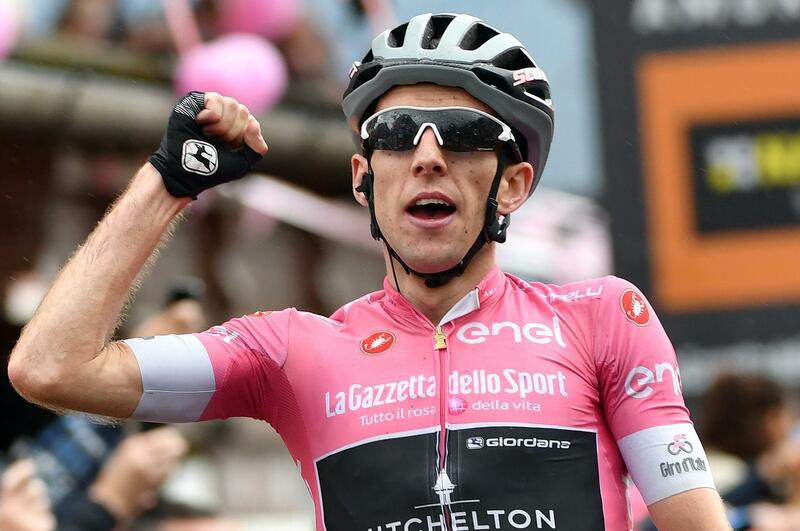 SAPPADA, Italy – Simon Yates made it a hat trick of wins in the Giro d’Italia on the 15th stage Sunday and the British rider consolidated his overall lead as the race heads into its final week. After unsuccessfully attempting a similar move just moments earlier, Yates set off on a solo attack with 17 kilometers (10.5 miles) remaining. He looked back after a few meters and continued to accelerate. Miguel Angel Lopez edged out Tom Dumoulin for second to lead a group of five cyclists over the line, 41 seconds behind Yates at the end of the 176-kilometer (109-mile) route through the Dolomites from Tolmezzo to Sappada. The grueling leg saw riders almost continuously climbing and descending. Yates is clearly on a different level to his rivals and it is hard to see anyone managing to wrestle the leader’s pink jersey off the Mitchelton-Scott cyclist. Yates extended his lead over defending champion Dumoulin to 2 minutes, 11 seconds. Domenico Pozzovivo remained third, 2:28 behind. Monday is the Giro’s third and final rest day before the individual time trial, which is Dumoulin’s speciality. Published: May 20, 2018, 8:17 p.m.